Hartsville, S.C. – July 27, 2018 – Coker College’s Cecelia Coker Bell Gallery presents the work of artist and inventor, Ryan Buyssens. Mr. Buyssens’s exhibit of inventions and kinetic sculpture, titled “RECIPROCAL,” opens Monday, August 27. The show runs through September 21, 2018. Buyssens is interested in visualizing logic and progress through the manipulation of various media. 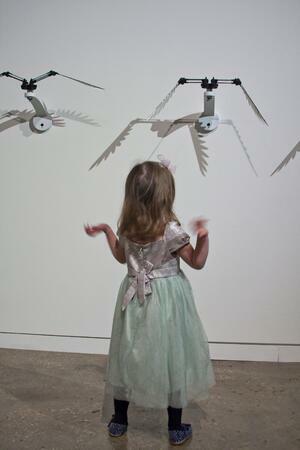 Recently, he has been exploring the interactivity of objects and environments in order to engage participants. Buyssens creates his devices with the use of electronic sensors and microcontrollers, computer design, 3D printing, laser-cutting and good-old-fashioned-patience. Viewers interact with the artwork by triggering sensors as they move through the gallery. Buyssens was born and raised near Detroit, MI. The automotive industry’s mechanized culture has been a lifelong influence. He received his MFA at Cranbrook Academy of Art, is a recipient of the North Carolina Artist Fellowship and has exhibited his work nationally and internationally. Notable exhibitions of his work include: Kinetica - 2013 at Manifest Gallery, Cincinnati, OH; The 2014 World Maker Faire, New York City; the 2015 3D PrintShow in London, Paris and Dubai; and the 2018 Currents New Media - Santa Fe, NM. His work can be found in the collections of Fidelity Investments, Ultimaker Corporation and The Orlando Science Center. Buyssens is currently an Assistant Professor of Sculpture and Applied Design at the University of Central Florida. For more information about the gallery, please call exhibition director, Renny Prince, at 843-383-8156, or email him at artgallery@coker.edu or visit http://www.ceceliacokerbellgallery.com/ . The Cecelia Coker Bell Gallery is open 10am to 4pm Monday, Wednesday and Friday, and from 10am to 8pm on Tuesday and Thursday while classes are in session. The Gallery is located in the Gladys C. Fort Art Building on the campus of Coker College in Hartsville, South Carolina. For more on the gallery, please visit www.ceceliacokerbellgallery.com. Coker College upholds and defends the intellectual and artistic freedom of its faculty and students as they study and create art through which they explore the full spectrum of human experience. The college considers such pursuits central to the spirit of inquiry and thoughtful discussion, which are at the heart of a liberal arts education. Coker College is a student-focused, private liberal arts college located in Hartsville, South Carolina. Coker combines round table, discussion-based learning with hands-on experiences to encourage active participation in and out of the classroom. A supportive, close-knit community prepares Coker students with the confidence and practical life skills they need to reach their personal best, in college and beyond. Founded in 1908, Coker is a bachelor’s and master’s degree-granting institution and competes in 21 NCAA Division II sports. 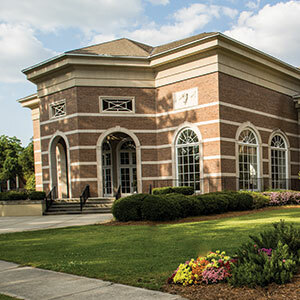 Coker is ranked among the "Best Colleges" in the South by U.S. News & World Report as well as The Princeton Review, and by Washington Monthly as No. 5 for value among colleges in the Southeast region.